Nothing against Home Depot. Probably wasn't even Home Depot where they bought the paint and tiles. But the previous owners should have left the finishing to the professionals. I love Linwood / Lindal cedar post-and-beam homes, always have, always will, and this one caught my attention. From the thumbnail picture, shown here, we couldn't be too sure on the details, so we drove the 2 hours, with kids in tow, and set out to find the truth. This could be the dream property for us, the one we've been hanging out for. First step, view the property. Nice drive up the hill, the realtor who came along with us was glad I had an SUV (they do come in handy when you have a long, unplowed driveway in the winter, saved getting out the snow shoes). The long winding driveway was great, what a cool piece of land. I love it. 12 acres of paradise, pines and firs, georgeous view of the valley. 12 minutes to the beach/coffee shop, and 20 minutes to the ski hill, a true Canadian happy medium. We get to the house. Oh oh. First impression ... something's not right. Those of you with an eye for screwups on the jobsite will know what I mean. 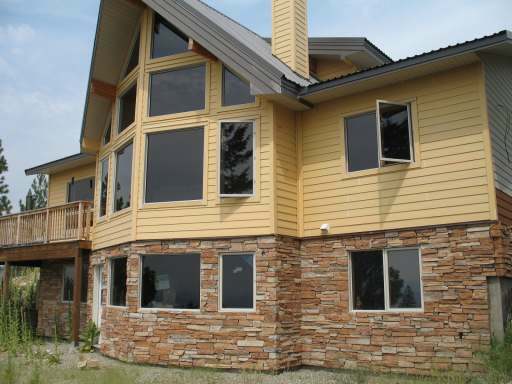 They used Hardi Plank for the exterior, a cement fibreboard siding that is quite popular in these parts. Bonus. Paint is peeling though, after only 2 years. Minus. Did they prime? Doesn't look like it. What paint did they use? Who's idea was it to use those colours (pale yellow)? We enter. I can live with the reddish tile floor, though the colour would be near the last on my list of faves. The glulam beams are impressive, I'm liking it. Go to the kitchen. Where's the stove? Oh, they forgot that beauty, but I did find 220 behind some drawers. Cabinet doors are missing. What's up with the kitchen island? Inches way too high, and not very useful, unless Mrs. Previous Owner was 7'-6". Living room - inspiring. Small, but inspriing. The view will sell this house, if everything else is screaming "don't buy me". The fireplace looks like an afterthought, but glad it's there. The geometry of the room was odd. My daughter asked, "what's this space for?" Guess it could be where I go when my wife gives me time out. Blue, red, pistachio walls, brown carpet, red tiles with a clashing baseboard to, er, match, what's up with the colors? Why do people think they can go to the local home improvement store and be a hero? Oh, what $200 worth of interior design advice from a professional would have done for the value of this house! I look up at the ceiling in the hallway, and main bath, water stains, oh oh, the house is only 2 years old. Enter the main bathroom. How on earth did the 12 inches between the tub and the sink pass code? Will have to ease up on the twinkies if I want to make it to the toilet in the corner. Oh, and the baby blue tile? See previous paragraph. The deck is a bit of a concern too, wood looks weathered, not sure how many years it will last, and water is pouring off the prow roof onto the deck in front. Some detailing issues, but I was made aware of a few of these from the friendly neighbourhood building inspector. I could go on. And I will for a bit, this is fun. The master bedroom in the open loft is a cool concept if you're kidless and the honeymoon is still going strong, but I'll either need to put locks on the kids' bedroom doors that lock from the outside, or buy 15 years supply of ear plugs for 'em. The mechanical room is impressive. You can tell we're from the "city" when we saw the big water jug in the basement, the size of a Volkswagon Bug. My better half thought it was a crude sauna, and I was hoping it wasn't some fancy new sewage treatment system. I ascertained pretty quickly it would be our H2O. Wouldn't want that baby to spring a leak. No sabotage that I can see from the previous owner. Looks like they left in a hurry, kids stuff, office stuff, garbage, computer, toys all over the house. Shame it ended in a mess for them. This is a court ordered sale, and often they can be a bit messy. 'Nuf said. Can you believe despite all this, I haven't ruled it out? Am I crazy? In my humble opinion, the only one who's crazy is the guy who didn't accept the previous offer of $half a mil. Anyone who offers more proves the theory of irrational buying behaviour. This place will need many $10K's of fixin's just to get it to it's assessed value. With no warranty, and still no occupancy permit (final inspection pending), this one may remain on the for sale list for some time. BuildIT could have helped all the "professionals" who got the house to lock up, no question. But left in the hands of a homeowner with bad taste to finish, the poor castle didn't have a chance. Have you ever had someone butcher your work, desecrating the thing you poured hours into? Let us know, we'll post it here for the rest.